Stephen Percy Harris (born 12 March 1956) is an English musician, songwriter, bassist, occasional keyboardist, backing vocalist, primary songwriter and founder of the British heavy metal band Iron Maiden. He has been the band's only constant member since their inception in 1975 and, along with guitarist Dave Murray, one of only two members to have appeared on all of their albums. Harris has a recognisable and popular style of bass playing, particularly the "gallop" which can be found on several Iron Maiden recordings, such as the singles "Run to the Hills" and "The Trooper". In addition to his role as the band's bass player, writer and backing vocalist, he has undertaken many other roles for the group, such as producing and co-producing their albums, directing and editing their live videos and performing studio keyboards and synthesizers. He has been cited as one of the greatest heavy metal bassists. Harris was born and grew up in Leytonstone, where he grew up aspiring to be a professional footballer. Scouted by Wally St Pier, Harris was asked to train for West Ham United. After gaining an interest in rock music in his early teens, he realised that he no longer desired to play football professionally. Initially Harris wanted to play drums, but did not have enough space for a drum kit in his house and so decided on the bass instead. Entirely self-taught, his first bass was a copy of a Fender Precision model which cost him £40 in 1971. Just 10 months after he bought his first bass, Harris joined a band, initially known as Influence and later Gypsy's Kiss, featuring Bob Verscoyle (lead vocals), Dave Smith (guitar) and drummer Paul Sears. After a short number of gigs at the Cart and Horses pub in Maryland Point, Stratford and the Bridgehouse in Canning Town, the band split up and Harris auditioned for a band called Smiler in February 1974. In this outfit, Harris began writing his own songs and worked with future Iron Maiden members Dennis Wilcock and Doug Sampson, but left the band after they refused to play his material, claiming it was too complicated. Upon leaving Smiler, Harris went on to create Iron Maiden on Christmas Day 1975, with the band's name being inspired by the film The Man in the Iron Mask. Before Iron Maiden signed their contract with EMI in 1979, Harris worked as an architectural draughtsman in the East End of London (he had studied architectural drawing at Leyton Sixth Form College) until he was made redundant, at which point he undertook a job as a street sweeper. Since their inception, Harris has been the band's principal composer and lyricist. His song writing typically showcases his trademark galloping bass patterns, which features heavily in songs such as "The Trooper" and "Run to the Hills", and his progressive rock-influenced time changes. Recently, Harris' songs have become more progressive, and guitarist Adrian Smith has commented that Harris now prefers contributing "lyrics and melodies and arranging" to other member's songs over writing alone. Harris frequently writes lyrics about mythology, history or topics inspired from books and films, reflecting his interests and progressive rock influences. In September 2012, Harris released his first solo album, British Lion. Originating with a band, named British Lion, which he managed and wrote with in the early 1990s, Harris kept in touch with its vocalist, Richard Taylor, and guitarist, Graham Leslie, and the album, consisting of 1970s influenced hard rock songs, was written and recorded over a number of years around Iron Maiden's tour schedule. Speaking to Kerrang! in September 2012, Harris stated that he considers the record to be "more of a side-project" than a solo album, as he is more "comfortable in a band environment." In an interview with Classic Rock in August, Harris stated that he will be releasing more solo albums and hopes to tour with the band in the future. Harris has taken the outfit on two separate European club tours in 2013 and 2014, with an additional tour taking place in 2016. On 2 September 2016, Harris announced that he intends to issue a live album recorded at shows from across the three tours. 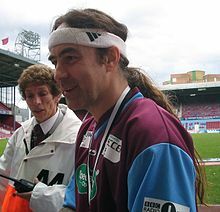 Harris at West Ham United's Boleyn Ground during Soccer Six 2005. Harris' eldest daughter, Lauren, is a singer and supported Iron Maiden with her solo outfit in 2006 and 2008. In 2008, she released a solo album, entitled Calm Before the Storm, and is currently a member of a band called Kingdom of I after forming Six Hour Sundown. In addition, Harris' oldest son, George, plays guitar in a band, the Raven Age, who were the opening act on Iron Maiden's The Book Of Souls World Tour in 2016. His second-oldest daughter, Kerry, works as a Production Assistant for Iron Maiden while his third-oldest daughter, Faye, is a fashion writer for HuffPost. In 1993, Harris was divorced from his wife, Lorraine, whom he met 16 years previously. He later said this was "probably the toughest time I've ever faced," and the changes in his personal life are credited with inspiring the mood of the following Iron Maiden album, 1995's The X Factor. Harris has four children with Lorraine: Lauren, Kerry, Faye and George, and two children with current partner Emma: Stanley and Maisie. Since the 1980s, Harris has owned a Grade II listed building in Sheering Essex, in the grounds of which he built his own recording and editing studio, "Barnyard". In November 2012, the nine-acre property was put on sale, with a spokesman for his estate agent, Hamptons International, stating that "he now lives between Los Angeles and the Bahamas". A keen footballer, Harris played for amateur clubs as a child and was later scouted by Wally St Pier and asked to train for West Ham United, of whom he has been a fan since he was 9 years old. Although he had aspired to play professionally up to that point, Harris would eventually realise that "it wasn't really what [he] wanted to do." Nevertheless, Harris still plays football regularly with his own team, "Maidonians", and still supports West Ham, staying in contact with the club, and having their crest on his most-used Precision Bass. Harris is often considered among the best and most influential heavy metal bassists. He is most known for his "galloping" playing style: usually an eighth note followed by two sixteenth notes at fast tempo (e.g., "The Trooper" and "Run to the Hills") or eighth note triplets, which he plays with two fingers, rather than using a plectrum. Before playing, Harris often chalks his fingers, to make these fast patterns easier to play, as shown on the bonus DVD for the A Matter of Life and Death album. Iron Maiden guitarist Janick Gers has commented that "Steve taught himself in a way that nobody can really copy it. People say it's like a lead guitar, but it's not. It gives the band a basis and it moves around quite a lot, but it's the tone that he has. Steve has a way of hearing things and a tone that isn't normally associated with a bass, it's more like a rhythm guitar." Harris was influenced by the progressive rock bands of the 1970s, as well as early hard rock and heavy metal bands. His influences include Black Sabbath, Deep Purple, Emerson, Lake & Palmer, Genesis, Jethro Tull, Led Zeppelin, Pink Floyd, Thin Lizzy, UFO, Uriah Heep, Wishbone Ash, and Yes. Speaking about the early Iron Maiden sound, Steve Harris described the band as using twin-guitar harmonies inspired by Wishbone Ash and Thin Lizzy, complex time and mood changes from Genesis and Jethro Tull, and the dark melodic elements of Black Sabbath, Deep Purple, and Led Zeppelin. Harris mainly plays a specially-painted Fender Precision Bass, featured on every Iron Maiden album, which has gone through a total of four colour changes since he began using it. Originally white, it was then changed to black prior to the band's first album, followed by blue sparkle and finally white with claret and blue pinstriping with the West Ham United F.C. crest. Harris has had his bass modified to include a mirrored scratchplate, Badass bridges and Seymour Duncan custom SPB-1 pickups and uses his own signature set of RotoSound flatwound strings. In 2009, Fender issued a signature Steve Harris Precision bass, featuring an alder body, a blue-sparkle finish, mirrored scratchplate, Seymour Duncan SPB-1 pickups and a Badass II bridge. In 2015, Fender released a revised model of the signature bass, which now features a maple body, a white finish with blue pinstripes and the West Ham crest, a Fender High Mass bridge and a Seymour Duncan SPB-4 Steve Harris signature pickup, with the pickup also being sold separately. In 2005, Metal Hammer reported that he uses eight 4x12" Marshall cabinets with Trace Elliot amplifiers. He also uses four Sony WRT 27 wireless transmitters, allowing him to be as mobile as possible on stage. A diagram of Harris' 2000 bass rig is documented on GuitarGeek.com. Although he performed keyboards on Seventh Son of a Seventh Son, along with guitarist Adrian Smith, in 1988, Harris only began regularly contributing keyboards to Iron Maiden's studio albums from Virtual XI onwards. Until Virtual XI, Michael Kenney, Harris' bass technician, had provided the keyboards from 1990's No Prayer for the Dying onwards, and still does so live and acts as a supervisor in the studio. Along with Smith and guitarist Dave Murray, Harris experimented with synthesizers on the Somewhere in Time and Seventh Son of a Seventh Son albums, using bass synth on Somewhere in Time, and performing "string synth" keyboards on Seventh Son of a Seventh Son. 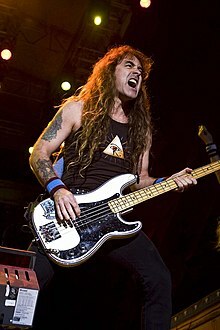 Steve Harris is also known for playing an increasing role in mixing the band's albums and produced most of their 1990's output, with recording taking place at a studio he owned at the time, located in a barn on his property, named "Barnyard Studios". Since 2000's Brave New World, at Bruce Dickinson's insistence, the band did not record again at Barnyard, which Dickinson claims had limitations due to its size, and hired Kevin Shirley, with whom Harris co-produces. Harris also directs and edits many of the band's live videos, beginning with Maiden England in 1989. Although not intending to himself, Harris edited the Rock in Rio DVD as he was unsatisfied with the results produced by the band's hired production crew. In undertaking the project, Harris had to teach himself how to use digital editing software with equipment he had installed in Barnyard Studios, and went on to edit Iron Maiden's next DVD, Death on the Road. On top of this, he has contributed to the production of thirteen of the band's music videos, with "Infinite Dreams", "Holy Smoke", "Tailgunner" and "Bring Your Daughter... to the Slaughter" being directed and edited by Harris alone. 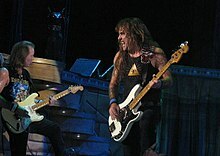 Harris (right) performing with Dave Murray in 2008. ^ a b Wall 2004, p. 15. ^ a b c d Wall 2004, p. 17. ^ a b c d Wall 2004, p. 20. ^ a b c The History of Iron Maiden – Part 1: The Early Days (DVD). EMI. 23 November 2004. ^ Gers, Janick. "Steve Harris as known by Janick Gers". Iron Maiden Official Website. Archived from the original on 19 August 2010. Retrieved 11 February 2012. ^ Wall 2004, p. 21. ^ Wall 2004, p. 23. ^ Wall 2004, p. 24. ^ Wall 2004, p. 25. ^ a b Wall 2004, p. 26. ^ Wall 2004, p. 28. ^ a b c Ling, Dave (2005). "Powerslave Driver". Metal Hammer presents: Iron Maiden 30 Years of Metal Mayhem: 31–34. ^ Wall 2004, p. 114. ^ a b c "The 60 greatest bassists of all time – 16/60, Steve Harris". MusicRadar. 24 September 2010. Archived from the original on 24 October 2013. Retrieved 21 September 2011. ^ Huey, Steve. "Piece of Mind – Review". AllMusic. Rovi Corporation. Retrieved 19 November 2011. ^ Lawson, Dom. "666 of the Best". Kerrang! Legends (2): 36–37. ^ a b c d e f g h i "Iron Maiden Bassist Talks About His Technique And Influences". Blabbermouth.net. 24 September 2004. Retrieved 25 April 2008. ^ Dome, Malcolm (September 2006). "The Good Life". Classic Rock (97): 76. ^ McIver, Joel (December 2010). "Iron Maiden: Adrian Smith". Total Guitar (208): 40–42. ^ Popoff, Martin (2005). "Maiden at the Movies". Metal Hammer presents: Iron Maiden 30 Years of Metal Mayhem: 104–105. ^ Young, Simon. "Iron Men". Kerrang! Legends (2): 90–93. ^ "Iron Maiden's Steve Harris Announces First Ever Solo Album 'British Lion'". Metal Hammer. 18 July 2012. Archived from the original on 23 February 2014. Retrieved 18 July 2012. ^ a b Garner, George (15 September 2012). "Beyond the Beast". Kerrang! (1432): 22–27. ^ Brannigan, Paul (27 August 2012). "Exclusive: Iron Maiden's Steve Harris talks about his British Lion solo project". Classic Rock. Archived from the original on 20 October 2013. Retrieved 8 September 2012. ^ "Iron Maiden's Steve Harris Taking British Lion on the Road – "It's Exciting, Going Back to the Roots, And It's Going To Be Fantastic"". Brave Words & Bloody Knuckles. 10 January 2013. Retrieved 10 January 2013. ^ Kielty, Martin (7 April 2014). "Steve Harris confirms British Lion tour". Metal Hammer. TeamRock. Retrieved 5 September 2014. ^ Kielty, Martin (5 September 2016). "Steve Harris details British Lion tour". Classic Rock. Retrieved 9 September 2016. ^ "Bio of Lauren Harris". Monstroentertainment.com. Archived from the original on 10 April 2007. Retrieved 11 April 2007. ^ Lane, Dan (22 May 2008). "Iron Maiden Kick Off Tour's 2nd Leg". Metal Hammer. Archived from the original on 23 July 2013. Retrieved 21 November 2012. ^ "Iron Maiden Bassist's Daughter To Release Debut Album in May". Blabbermouth.net. 20 February 2008. Retrieved 21 November 2012. ^ "Kingdom of I – About". Archived from the original on 29 October 2013. Retrieved 25 October 2013. ^ "Six Hour Sundown Myspace". Myspace. Retrieved 30 August 2011. ^ "The Raven Age Featuring Iron Maiden Bassist's Son George Harris: Toulouse Concert Footage". Blabbermouth.net. 25 July 2014. Retrieved 26 July 2014. ^ Lach, Stef (13 August 2016). "Raven Age guitarist George Harris chose metal over football". Team Rock. Retrieved 5 June 2017. ^ McMurtrie, John. Iron Maiden: On Board Flight 666 (1 ed.). Orion Books. p. 139. ISBN 978-1-4091-4136-5. ^ "Faye Harris MFA Fashion Journalism, Academy of Art University". HuffPost. Retrieved 5 August 2017. ^ a b c Wall 2004, p. 311. ^ Iron Maiden (6 June 2011). "Iron Maiden Thank- Steve Harris:". From Fear to Eternity Booklet. EMI. ^ a b Hills, Suzannah (3 January 2013). "Iron Maiden bassist puts his £7m mansion on the market". The Daily Mail. Retrieved 4 January 2013. ^ a b Wall 2004, p. 316. ^ Holland, Sinead (28 November 2012). "Iron Maiden rocker's Sheering home for sale". Herts and Essex Observer. Archived from the original on 4 December 2012. Retrieved 4 January 2013. ^ Wall 2004, p. 16. ^ "Iron Maiden Drummer To Perform at Guitar Show, Bassist To Play at Soccer Tournament". Blabbermouth.net. 8 May 2004. Retrieved 30 August 2011. ^ Brady, Karren (7 January 2011). "Karren Brady's football diary". The Sun. London. Retrieved 30 August 2011. ^ a b "West Ham's Top Ten Most Famous Fans- Steve Harris". Footballfancast.com. Archived from the original on 9 October 2011. Retrieved 30 August 2011. ^ "Top 10 Bassists of All Time". Ultimate Guitar Archive. 11 April 2011. Retrieved 11 May 2013. ^ Hartmann, Graham (22 October 2013). "Iron Maiden's Steve Harris Wins Loudwire's Greatest Metal Bassist Tournament". Loudwire. Retrieved 22 October 2013. ^ "Steve Harris Precision Bass®". Fender. Archived from the original on 22 January 2013. Retrieved 21 September 2011. ^ Bacon, Tony; Bradman, E.E. (September 2004). "Harris Is Interested in Writing Good Songs". Bass Player. Retrieved 21 September 2011. I've always found it easier to play with my fingers; I never learned to play with a pick. I never thought about it as a "technique" – it was just the way I learned to play. ^ Classic Albums: Iron Maiden – The Number of the Beast (DVD). Eagle Vision. 4 December 2001. ^ a b Wall 2004, p. 27. ^ a b Bienstock, Richard (3 July 2011). "Maiden Voyage". Guitar World. Retrieved 10 October 2011. ^ Bienstock, Richard (3 July 2011). "Iron Maiden: Maiden Voyage (page 2)". Guitar World. Retrieved 10 October 2011. ^ "Life on the Road". Death on the Road (DVD). EMI. 6 February 2006. ^ a b c d Heatley, Michael (2005). "Hardware". Metal Hammer presents: Iron Maiden, 30 Years of Metal Mayhem: 70. ^ "Exclusive video: Fender Iron Maiden signature guitars". MusicRadar. 13 May 2009. Retrieved 28 September 2012. ^ Bradley, Simon; Newell, Roger (22 June 2009). "Fender Steve Harris Precision bass". MusicRadar. Archived from the original on 5 March 2016. Retrieved 28 September 2012. ^ "Steve Harris Precision Bass®". Fender Musical Instruments Corporation. Retrieved 11 August 2016. ^ "Steve Harris P-Bass SPB-4". Seymour Duncan. Retrieved 11 August 2016. ^ Cooper, Adam (2000). "Steve Harris' 2000 Iron Maiden Bass Rig" Archived 17 August 2012 at the Wayback Machine. GuitarGeek.Com. ^ a b Wall 2004, p. 300. ^ a b Iron Maiden (2 June 2003). "Video credits". Visions of the Beast DVD cover. EMI. ^ a b Wall 2004, p. 359. ^ a b "Virtual XI album credits". AllMusic. Rovi Corporation. Retrieved 27 September 2011. ^ Wall 2004, p. 258. ^ Barton, Geoff (2005). "Commercial Break". Metal Hammer presents: Iron Maiden 30 Years of Metal Mayhem: 106. ^ Gennet, Robbie (3 October 2010). "Michael Kenney – the Man Behind the Maiden". Keyboard Magazine. Archived from the original on 16 May 2013. Retrieved 19 April 2012. ^ Shirley, Kevin. "Final Frontier recording diary". ironmaiden.com. Retrieved 27 September 2011. Michael Kenney set up the keys and Steve poked away at them, hunting for the melodies running around his head like a chicken pecking the ground. ^ Wall 2004, p. 158. ^ Iron Maiden (29 September 1986). "Album credits". Somewhere in Time Booklet. EMI. ^ Iron Maiden (11 April 1988). "Album credits". Seventh Son of a Seventh Son Booklet. EMI. ^ a b Berelian, Essi (June 2000). "The Wicked Man". Classic Rock (15): 36–43. ^ Iron Maiden (16 August 2010). "Album credits". The Final Frontier Booklet. EMI. ^ Wall 2004, p. 275. ^ Wall 2004, p. 358. ^ "Steve Harris credits". AllMusic. Rovi Corporation. Retrieved 21 November 2012. ^ "Deeds Set Tentative Release Date For Blown". Blabbermouth.net. 23 May 2002. Retrieved 6 September 2016. Wikimedia Commons has media related to Steve Harris.